When you choose to sell you home, you will need to pick the best real estate agent available so that your house does not sit on the market for a long period of time. Choosing a real estate agent can be difficult, but these are 5 qualities you should look for in a real estate agent. 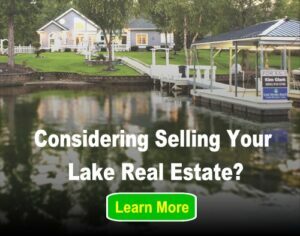 Selling lake homes is very different from selling in other locations. Make sure the agent knows the lake, shoreline restrictions, water levels, and nearby attractions. It is extremely important that the agent has excellent communication skills. You would be surprised to hear of how many bad experiences buyers have had with agents and bad communication. Your home should not be part of one of those stories. You can tell a lot about the agent by reading testimonials from past clients. You may find that the agent you are interested in may not be as honest as they appear to be. You will also need to make sure the agent is honest with you. You will need them to be honest and brave enough to tell you the truth about the property. You may want to sell your home for $400k, but the agent knows it will only sell for $300k you want them to be upfront with this information. Real estate can be a very demanding business; at times the buyer can be fickle. Getting a buyer to the location of the property is a crucial part of the sell. If the buyer only has a specific window of time to view the property, the agent needs to be on there on time. Putting the buyer off will put them off of the sell. Knowledge is crucial when being an agent. Your agent will need to know all of the laws, the process of selling homes, and every part of the real estate game. It is important that the real estate agent is knowledgeable so that there are no overlooked details in contracts and other aspects of the sell of your home. It is important that you meet your agent in person and ask for a portfolio. Do not be shy to ask questions or go to a different agent. It is your home and your money that they are responsible for in the end. Do plenty of online research and make sure you find a qualified lake expert agent to help you through the process. I really like the idea of using a real estate agent to help us find the best available homes for sale. Finding an agent who has great communication skills like you talked about is really important to my wife and I, especially when there will be new homes for sale that come on the market. We’ll have to interview a few agents, and talk to them about communicating and how effective they have been at helping find homes for sale in the past! I really like that integrity made it onto your list here because it really is something that people should look for when choosing a real estate agent. After all, whether you’re buying a new home or selling your old one, you want to make sure that you can rely on your real estate agent for help. An agent that shows a lot of integrity will always be there to help when you need it whether it is to answer a question or help you fill out some paperwork. It’s good to know that when it comes to finding a real estate agent that there are some qualities that we need to look for to make sure that we choose the one that will help us get the house of our dreams. I like how you mentioned that one thing we need to do is make sure that their schedule is one that will coincide with ours. It will be nice to have someone that will be on time to appointments and won’t put anything off. You really do have to remember that you are not the only client that your real estate agent will be serving at any given time. That’s why, before you hire them, you need to make sure that you are able to work each other into your schedules. After all, the house buying and selling process is very hands on, so you’ll need to meet with your real estate agent in person to get the most effective work done. I do like that your article emphasizes the importance of choosing a real estate agent that can communicate well. After all, being able to easily communicate back and forth with your agent is essential when selling or buying a home. You’d want to know right away if you’ve successfully bought the home or sold your old one. There really are a lot of different factors that you’ll have to research before choosing the perfect real estate agent. It is particularly great that the article brings up communication as one of the major things to look for in a real estate agent. After all, you will want to be able to easily get in touch with them if they have an update on your home sale or purchase. My husband and I are needing to buy our first home before our daughter is born and need to find an agent to help us. Thank you for suggesting that you should make sure and find an agent with great communication skills. I’ll have to keep this in mind as I search for the best agent in our area. Since I want to get out of my condo and into a house, I do think that having an agent help me is one of the better things I could do. Now as you said here, I’d want to find one that is knowledgeable about everything involved with the whole process. With that, I would be able to see how the process of buying is done along with any tips they would have to help me find the right home. Thank you for pointing out that you need to find a real estate agent that will be able to be punctual. My husband and I are currently looking for a real estate agent to help us buy our first home. I’ll have to do some research and find the best one in our area. It might not be the first thing that people think about when choosing a real estate agent, but it really is important to make sure that the one you hire is well versed in local real estate laws. As the article points out, you’ll want to make sure that they are knowledgeable about how real estate is handled in your area. That way they can close the deal on your purchase or sale through the correct legal channels. When it comes time to sell my home, I’ll for sure need to get some kind of help with it. As you said here, having a real estate agent with good communication skills would be quite important. That way, they would be able to let you know about anything that comes up during the selling process. I like how you mentioned that when choosing a real estate agent you should make sure they have excellent knowledge about all of the laws and processes of selling and buying homes. My husband and I are wanting to sell our house because of his new job in a different state, but we have no idea where to even begin. I will definitely keep your great tips in mind when looking for the best real estate agent to help us successfully sell our house as quick as possible.